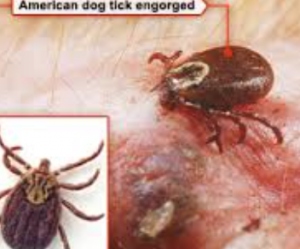 The best flea and tick prevention for your dogs is also the best product to kill any existing fleas and ticks. 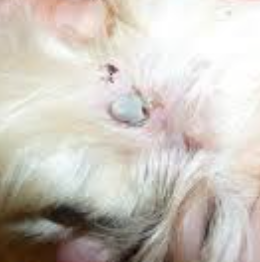 There is one product that not only treats adult fleas and its life stages, egg, larvae and pupae but is also the best flea and tick preventative measure you can take for your dogs. Wondercide not only kills existing fleas and ticks but can be used as a monthly treatment also as a preventative measure against these pests. This product is safe for dogs and puppies at any age, even nursing mommas! If you’re headed out for a walk or to the park, lightly mist your dog before or after to repel and kill any fleas or ticks that hitched a ride home. You can also spray pet bedding and furniture where your dog likes to spend time. To use on your dog, simply rub the coat in the reverse direction, spray, and rub in. Spray the body, legs, tail, belly, and armpits. Spritz into your hands to rub onto your dog’s ears and face. Repeat 2-3 times per week or as needed. Wondercide is safe to use with other flea and tick preventative medications but I was able to make Wondercide the only product that I needed to use on my pets. I spray it on them weekly during the warmer months and once a month during the winter months, since fleas aren’t as much a problem and my pets are indoors more than summer months. you’re going to want to treat the inside of your home as well with the same product you use on your dogs. 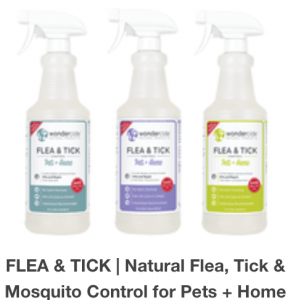 Although the product names are different, Wondercide Flea & Tick Control for Pets & Wondercides Indoor Pest Control, they have the same formulation and may safely be used interchangeably. They are simply labeled differently for end use and compliance reasons. You can spray the Wondercide directly on your furniture, pet bedding, curtains, carpets and even mop your floors with it to kill any existing fleas and ticks that are around your home. I would wash all bedding, both your pets and yours if your dog sleeps with you, in the hottest water you can and then dry on the highest heat setting to kill the fleas and the fleas life stages. 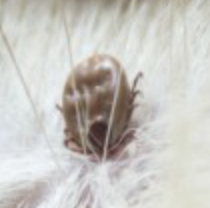 If you see fleas or ticks anywhere around your home or on your pets, just spray directly where you see them!